a. In the design of pyrolysis key device, completely overcome the local heat uneven, easy to break, low yield, short life and other unfavorable factors of the current vertical flat bottom pyrolysis plant. b. With fast and practical feed and slag system. c. Efficient gas heating system. In the process of refining, when the heated gas reaches 150 degrees Celsius, it will produce a lot of gas which can not be liquefied in normal temperature and pressure methane to butane.These gases are fully burned by specially designed gas nozzles, will produce a lot of energy which greatly saves energy. d.Flue dust removal system has a desulfurization dust cather(qualified), equipped with two ways water impact cyclone dust removal chamber, which can ensure the discharge of flue outlet reach safe discharge standard. First, two or three workers put waste tires into the host reactor from the feed gate, close the feed gate, and seal. Then start the fire and heat the main furnace with fuel coal or wood in the heating chamber. When the temperature reaches 150°C, part of the gas will precipitate (at this time most of the gas is exhaust gas). 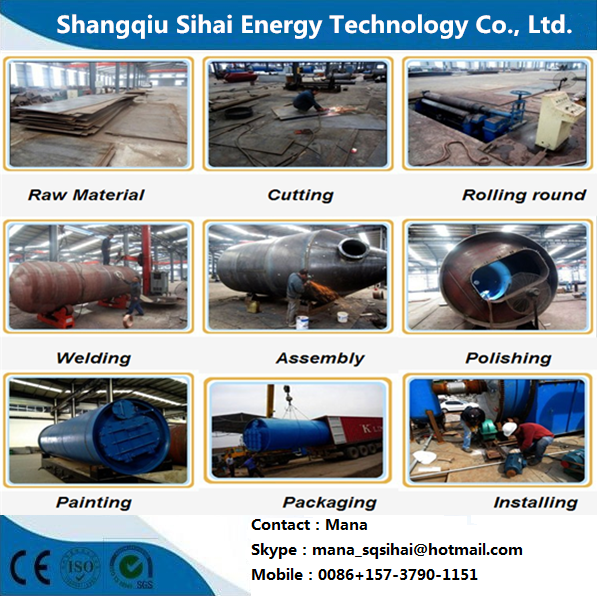 When the temperature reaches 220°C, oil and gas will precipitate and enter the gas distribution package. The residual oil (including some slag) will sink to the residue. Oil tanks, while light oils automatically enter the water cooling system, cooling, liquefaction. Enter the light tank. In this way, heavy oil and light oil can be obtained. Secondly, after condensation, some of the gas that cannot be condensed is called exhaust gas. The exhaust gas passes through a safe setting - the water seal. (The role of the water seal is to prevent the open flame from collapsing from the combustion chamber and the exhaust gas.) Return to the heating chamber as Fuel heating furnace. Therefore, at the beginning of the equipment operation, the fuel was coal or wood. When the temperature rose to 220°C-270°C, the exhaust gas could be used as a fuel. Under normal circumstances, the fuel needed per ton of waste tires is 60kg. Finally, the soot treatment: smoke from the main furnace and the housing out of the middle, into the flue condensation system, and then enter the desulfurization dust tower, desulfurization dust tower inside there are three processes: water, magnetic ring, stainless steel nozzle (atomizing, filtering smoke), The smoke is filtered and purified. More than 90% of the discharged gas is steam, free from pollution. Electricity consumption: The power consumption of the whole set of equipment includes: induced draft fan (4-7.5KW), reducer (3--5.5KW), water pump (1.5KW) and oil pump (1.5KW). A total of 10-16 kW, so the entire operation process, the power consumption is minimal. 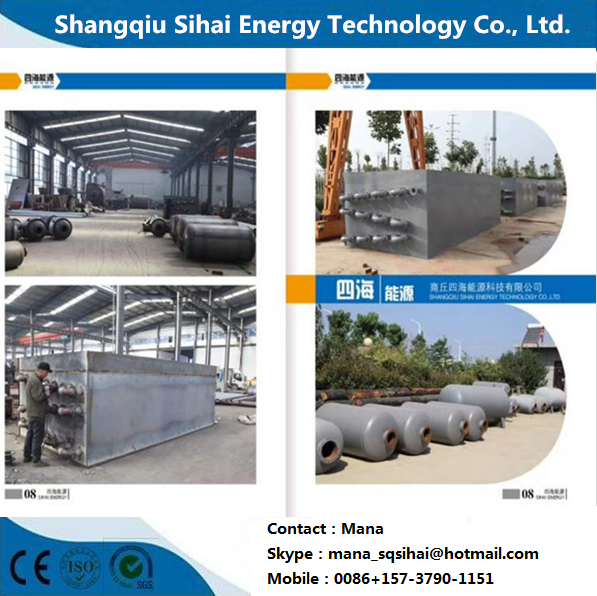 Shangqiu Sihai Energy Technology Co., Ltd is a collection of research and development, production, sales and after-sales services, which has rich experience in the field of waste management over 20 years. Our company covers an area of 37,000 square meters. Our company has a huge professional technical team, including 2 senior engineers, 16 senior technicians, 28 mid-class technicians, and 82 technicians. Our main products are divided into two catalogries: pyrolysis plant and distillation machine, including tires pyrolysis plant, tyre pyrolysis plant, waste rubber pyrolysis equipment, waste plastic recycling machine and other waste management machines, and waste oil distillation equipment, waste engine/motor oil recycling machine, tire oil distillation plant, plastic oil refinery machine and crude oil distillation equipment. Our products have been exported to South Korea, Thailand, the Philippines, India, Malaysia, Malaysia, Myanmar, Afghanistan and the United States and other countries and regions, which obtain a good reputationand happy feedback.